Please contact owner TIM via Email: tmech1@sbcglobal.net - or Phone: 817-768-7908. Boat Location: Fort Worth,Texas. 48 hours total time. 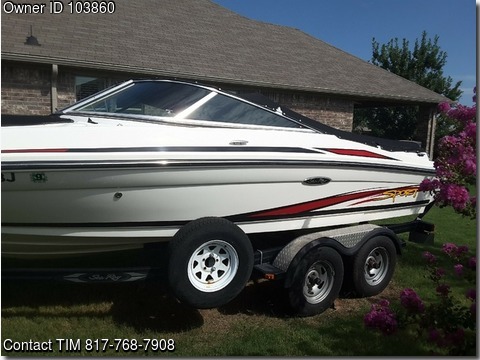 Includes Depth Gauge, AM/FM Stereo w/Detachable Face, & Ipod Connection, Snap-Out Carpet, Lots Of Storage, Bilge Pump, Coast Guard Pack w/Life Jackets, Anchor, Dock Bumpers, Swim Platform, Hydraulic Steering, Spare Prop, Bimini Top, Cockpit & Bow Covers, Matching Tandem Axle Trailer. This Sea Ray has been Professionally Maintained by its Original Owner.